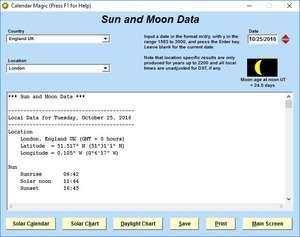 Calendar Magic is a very comprehensive calendar system for Windows which not only supports your standard Georgian calendar, but also includes supports for a huge number of other calendars either currently used or used in history. It also provides access to solar and lunar phases. The program provides many different tools, including those which convert between different date formats. It displays holidays for many different regions of the world including those for all major faiths and religions. Version 19.1 is a freeware program which does not have restrictions and it's free so it doesn't cost anything. For security reasons, you should also check out the Calendar Magic download at LO4D.com which includes virus and malware tests. Additional screenshots of this application download may be available, too.